Despite China’s military build-up, US submarines are more than a match for its sea defences, a recent report says. China's submarine fleet is largely limited to a coastal defensive role, but still could not prevent infiltration by US undersea boats, according to a recent analysis by Owen Cote Jr. of the Massachusetts Institute of Technology's Security Studies Programme. Only big shifts in doctrine and technology could alter the current equation, Cote explained. Cote's assessment is a fresh reminder of the obstacles China faces in securing its own waters – to say nothing of extending its influence farther into the Pacific. The report is also a reminder that, despite the high visibility of aircraft carriers, jet fighters and ballistic missiles, submarines are still the most decisive weapon in the evolving rivalry between Washington and Beijing. With their stealthiness and tremendous firepower, submarines pose a serious threat to surface vessels. For that reason, they are ideally suited to so-called sea denial – that is, keeping enemy fleets out of a given patch of ocean. That's precisely what Beijing intends for its force of roughly 50 small diesel-electric submarines and 10 or so larger nuclear boats. ‘China plans on using its diesel attack submarines…for coastal defence,’ Cote wrote. But the US Navy’s own submarines plus its patrol planes, helicopters, surface ships and underwater ‘listening’ arrays, concentrated in geographic choke points, could probably detect most Chinese subs attempting to reach the US fleet beyond the first island chain, Cote asserted. The superiority of US subs could severely limit the potential of China's own undersea fleet in a prolonged conflict, even degrading its coastal defence capability. Cote described US boats taking up positions outside Chinese ports, tracking and destroying PLAN subs as they left or entered. The American sub fleet's advantage would increase over time as more vessels arrived. Whether Chinese subs could exploit their moment of relative freedom is debatable. Even US submarines with their highly sophisticated sensors and combat systems rely on ‘cueing’ by land-based over-the-horizon radars, satellites or high-altitude surveillance aircraft that can steer them towards their targets. China possesses a rudimentary cueing capability in the form of several OTH radars and a small constellation of surveillance satellites. Beijing is also developing drone spy planes. The United States could find a new role for its submarines in destroying some of these cueing assets, further handicapping an already inferior Chinese undersea fleet. 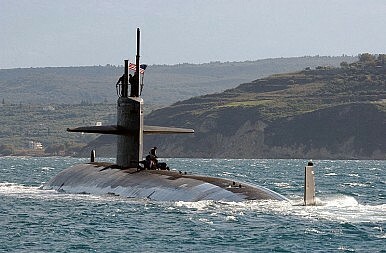 US subs are already armed with land-attack cruise missiles. For their own cueing against OTH radars on land, US boats could deploy small aerial drones – a capability already in development. Thus equipped, US submarines would also be capable of destroying a wider range of land targets, including China's hundreds of mobile missile launchers. The reported collapse of the sale of new F-16 jets is less of a blow to Taiwan than its failure to get submarines.